The loud trumpets called vuvuzelas will continue to be allowed for the time being at the World Cup, despite complaints from some international broadcasters, players and fans, the tournament’s organizing committee said Monday. Some broadcasters have been complaining since last June’s Confederations Cup here that the vuvuzelas are too disruptive to the international television feeds, subduing announcers’ voices and irritating viewers. Evra also said that the horns were disrupting the French players’ sleep and awakening them as early as 6 a.m. at the team hotel. 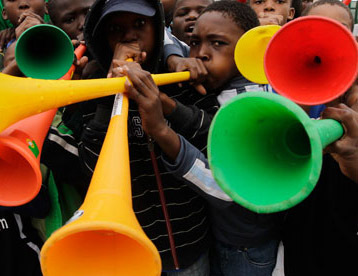 Banning the trumpets, though, would undoubtedly unleash a fierce response from South Africans, who see the vuvuzelas as an indispensable part of their soccer culture. Sepp Blatter, the president of FIFA, soccer’s world governing body, has supported the trumpets, saying Europeans must adjust to African traditions. In a statement on Monday, Rich Mkhondo, a spokesman for the World Cup organizing committee, reiterated that “the vuvuzela will continue to be allowed during the tournament and the status quo has not changed,” adding that complaints had been isolated. The organizing committee said that fans had heeded requests to refrain from blowing the vuvuzelas during national anthems and stadium announcements. “It’s our ability to sing that inspired and drove the emotions,” Jordaan said.